1620 UTC: The challenge has been extended by 24 hours on user requests. Note: Final submission will be evaluated on complete dataset and score will be computed. During the evaluation of the submissions, we have found several ambiguities and use of unfair tactics by users to crawl up the leaderboard. Unfortunately, this is not how machine learning is applied in the industry and we certainly do not appreciate such practices. As a last chance, you need to upload your final prediction file as well as the source code that produces that file by 31st January 06:30 UTC. You also need to include a README containing instructions to generate the output file. If we still find the discrepancies after the final deadline, we will be forced to disqualify you from the event. The final leaderboard is now live. We took the final submission before the original deadline(25th Jan 11.30PM IST) and evaluated on the complete test data set. Users eligible for the prizes will be contacted separately via email. Apart from this, we have also decided to give HackerEarth goodies to top 100 participants in the contest. 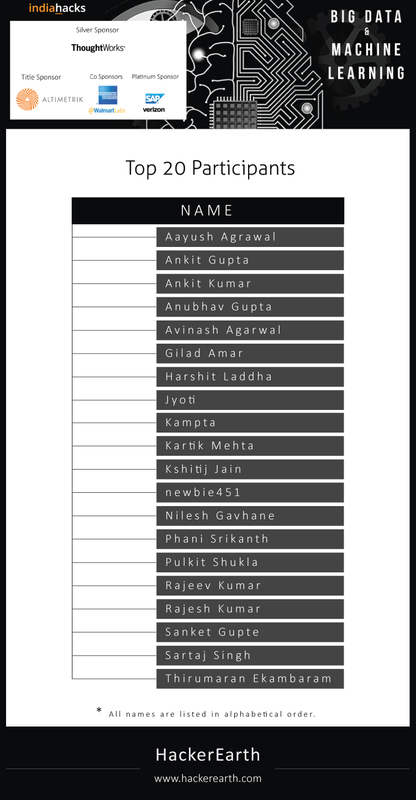 Our sincere apologies to all the participants for the glitches during the contest. This was a learning experience for us too and, hopefully, the next contest will be well defined and smooth. Hope you enjoyed solving the problem. To view the results of IndiaHacks Machine Learning Challenge Top 20 Participants click here. The ability to learn new things is one of the most human things to do and over the last decade, tremendous amount of work has been done to develop that capability in machines . This, combined with the ability to store and analyse vast amount of data that’s continually increasing with veracity, gives us a very powerful tool to solve some real world problems. This track of IndiaHacks is for those hackers, who are sitting at the intersection of statistics, data and algorithms. Based on the problem statement, you will have to build models to predict the correct output. You will then have to submit your output for the test data. Your solution will be evaluated only for 50% of the test data, and you will be awarded a score based on that. The remaining 50% of test data will be evaluated once the contest is over. Q: How will I be awarded score? Q: How can I submit my output? You will have to upload your output on the problem page in the format given in the problem statement. Q: Do I need to submit, anything other than the output? Yes, in addition to your output, you will also have to submit your source and other files in .zip or .tar compressed archive. Q: What tools can I use for building my solution? In addition to your output, you will also have to submit your source and other files in .zip or .tar compressed archive. The IP of the product/code of the winners will belong to HackerEarth, if they choose to accept the prize. Other developers will retain complete IP over their code/product and they may wish to put it in open source domain under any license they want to. By participating in the IndiaHacks: Machine Learning challenge, you agree to the terms and conditions of HackerEarth. Your rank will be calculated in real-time by evaluating 50% of your output while the contest is live. Once the contest has ended, your output will be evaluated on the remaining 50% of test data and the leaderboard will be updated in next 7 days. 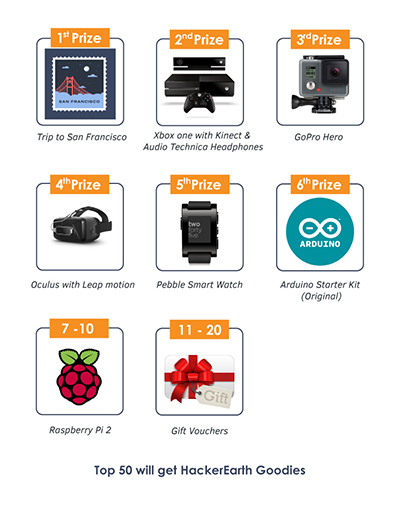 Are all first prize winners eligible for a trip to San Francisco? The sponsored trip to San Francisco, is subject to Visa availability. In the case of being unable to process a visa for a winner, an equivalent prize worth 2,000 USD will be awarded.